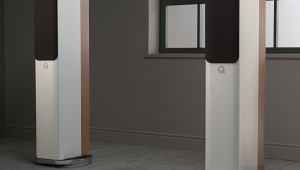 The Artis Baltic II "eyeball" had a high estimated voltage sensitivity of 90.5dB(B)/2.83V/m. Its impedance (fig.1) dropped to or below 4 ohms in the lower midrange and mid-treble but was otherwise quite high. 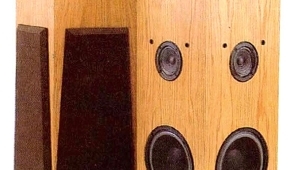 The speaker should not, therefore, be difficult to drive, though its use of a series capacitor to roll off the lows below 80Hz results in a combination of 6.7 ohms magnitude and –45° electrical phase angle at 73Hz, which might tax underpowered amplifiers. The traces in fig.1 are free from the small glitches that would imply the existence of cabinet resonant modes. I couldn't find any such resonances on the spherical enclosure, though the pedestal did vibrate a little in the lower midrange. The saddle centered on 89Hz in the impedance-magnitude trace suggests that this is the tuning frequency of the small port mounted on the side of the eyeball. 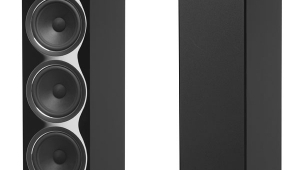 With this high a reflex-tuning frequency and the high-order rolloff, the Baltic II definitely needs to be used with a subwoofer. 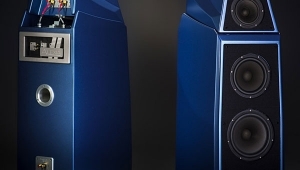 The Artis Thor II's crossover applies low-pass filtering to only the subwoofer; the satellite outputs are not high-pass filtered. Fig.2 shows the responses of the Thor II subwoofer's woofer and port, taken in the nearfield with the crossover control set to its highest frequency, 180Hz. 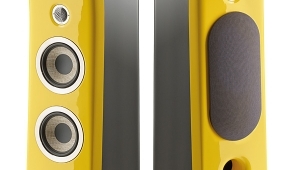 The setting appears to be the subwoofer's approximate –6dB point, while the port appears to be tuned to 28Hz. The upper-frequency rollouts of both radiators are free from the out-of-band spikes and discontinuities that would lead to coloration. Fig.2 Cabasse Artis Thor II, nearfield woofer and port responses with low-pass filter set to 180Hz. The colored traces on the left of fig.3 show the Thor II subwoofer's overall output with its low-pass filter set to 180Hz (pink trace), 120Hz (yellow), and 40Hz (green). 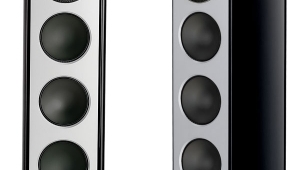 The level control was kept the same for these measurements, which means that it needs to be raised at the lower settings to keep the bass balance uniform. To my surprise, the 80Hz setting produced a response not significantly different from the 40Hz one, which is perhaps one reason Michael Fremer had problems with his initial setup. The black trace below 300Hz is the complex sum of the Baltic's nearfield midrange (red) and port (blue) outputs. 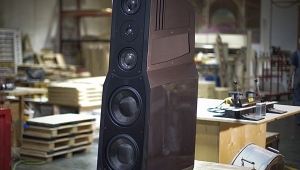 The satellite rolls out below 100Hz, which implies that setting the subwoofer's control to 80Hz would give the optimal crossover to the Thor II, provided the latter's level was increased appropriately. But as MF found this not to be the case, it is possible that, in addition to the woofer's 80Hz setting not being different from the 40Hz one, his room acoustics interfered with the integration of the two units, which is why he had to set the frequency a little higher. Fig.3 Cabasse Artis Baltic II, anechoic response on tweeter axis at 50", averaged across 30° horizontal window and corrected for microphone response, with the nearfield lower-midrange (red) and port (blue) responses, with their complex sum (black), as well as the complex sum of the Thor II's nearfield woofer and port responses, taking into account acoustic phase and distance from the nominal farfield point, with the low-pass filter set to 180Hz (pink), 120Hz (yellow), and 40Hz (green). Though the eyeball's port output peaks at the port's tuning frequency, the midrange unit's minimum-motion point, which is where the back pressure from the port resonance holds the diaphragm motionless, lies 10Hz lower, at 78Hz. 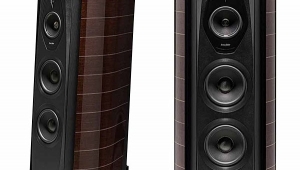 The Baltic II's response trend at higher frequencies is marred by a peak at 600Hz and a lack of energy in the octave-wide region above that frequency. The treble is basically flat, with small peaks balanced by small valleys. 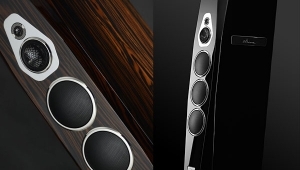 All things being equal, I suspect that MF's comments on the speaker's elevated presence region perhaps stem from the relative lack of lower-midrange energy rather than from the mid-treble balance, and that it was this lack that exacerbated his problems with integrating the satellites with the subwoofers in his room. 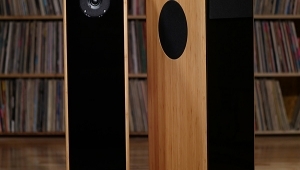 A speaker's perceived response, of course, depends not only on its on-axis behavior but also on its dispersion, which will affect the balance of the reverberant soundfield in the listening room. Fig.4 shows that the Baltic's horizontal radiation pattern is uniform in the midrange but maintains that uniformity only within a narrow (±15°) window at higher frequencies. 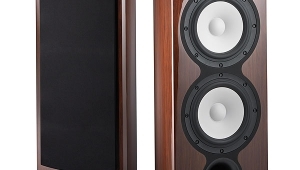 A presence-region suckout develops at greater off-axis angles and the speaker becomes more directional at high frequencies than I would have expected. In large rooms, the Baltic might well sound rather dull. In the vertical plane, plotted only to ±15° away from the tweeter axis (fig.5), the speaker's symmetrical design leads to a similar dispersion to the horizontal pattern. Fig.4 Cabasse Artis Baltic II, lateral response family at 50", normalized to response on tweeter axis, from back to front: differences in response 90–5° off axis, reference response, differences in response 5–90° off axis. Fig.5 Cabasse Artis Baltic II, vertical response family at 50", normalized to response on tweeter axis, from back to front: differences in response 15–5° above axis, reference response, differences in response 5–15° below axis. So far, I have discussed the quasi-anechoic measurements of the Baltic II and Thor II, taken either in the nearfield or with the satellite far above the ground, on a high stand. By contrast, fig.6 shows the Baltic and Thor's response in MF's listening room. To produce this graph, I averaged 120 1/3-octave measurements for each speaker, taken at nine positions on a grid centered on the position of Mikey's ears in his listening chair. 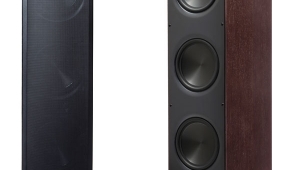 Though the upper midrange and treble are well balanced, with good frequency extension, there is still an apparent lack of energy in the lower midrange—just before the subwoofers, set to MF's preferred control positions, come in. The bass is flat down to the 31.5Hz 1/3-octave band, with a relatively quick rollout below that region. 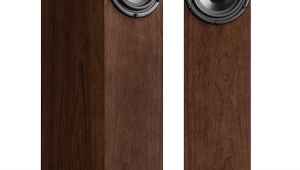 Fig.6 Cabasse Artis Baltic II & Thor II, 1/3-octave, spatially averaged response in MF's listening room. The Baltic II's step response on the tweeter axis (fig.7) is complex, the drive-units' steps arriving at the measuring microphone at successively later times. Some ringing can also be seen, which manifests itself in the speaker's cumulative spectral-decay graph (fig.8) as ridges of delayed energy between 600–700Hz (the region where the on-axis response has its peak) and 3.8kHz. I suspect that the small peak in the on-axis response at this frequency correlates with MF's comment that, when played back at high levels, "the system's sound became somewhat glassy, bright, and a bit forward." Fig.7 Cabasse Artis Baltic II, step response on tweeter axis at 50" (5ms time window, 30kHz bandwidth). Fig.8 Cabasse Artis Baltic II, cumulative spectral-decay plot at 50" (0.15ms risetime).